Hey, true-believers! It’s been a long time… about 2 years since the last post. Since then, I had to get a day job (paychecks! ), a house (adulthood! ), and had a daughter (hurray!). It’s been so long that I decided I hated the look of the website, so I switched it up for a more modern look, and the rest of 17 Presidents’ branding will be shifting soon as well. But fear not, I’ve been able to return to work on “Jupiter IX,” and recently finished off the storyboard! You remember Bud, right? Because he remembers you. The first thing I do when working on a sculpture like this (especially one that requires me to design to specific size) is to quickly sketch out the silhouette of the character at the scale I want. 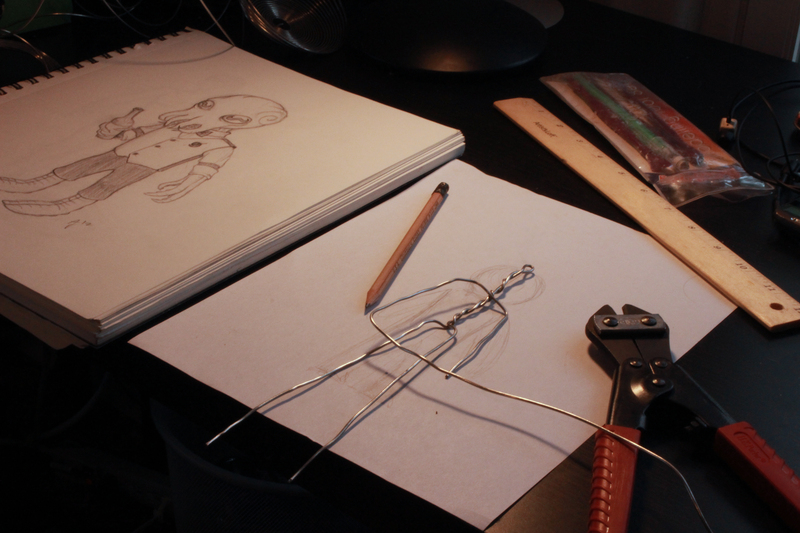 Next, armature wire is bent into shape to create a rough skeleton. I’m using .025″ wire, which is easy to manipulate with your bare hands, but you need to double back and twist the wire together wherever the skeleton needs to support weight (the spine and the legs are the most important areas for this). Next, I used tin foil to bulk out Bud. This is useful for a few reasons. 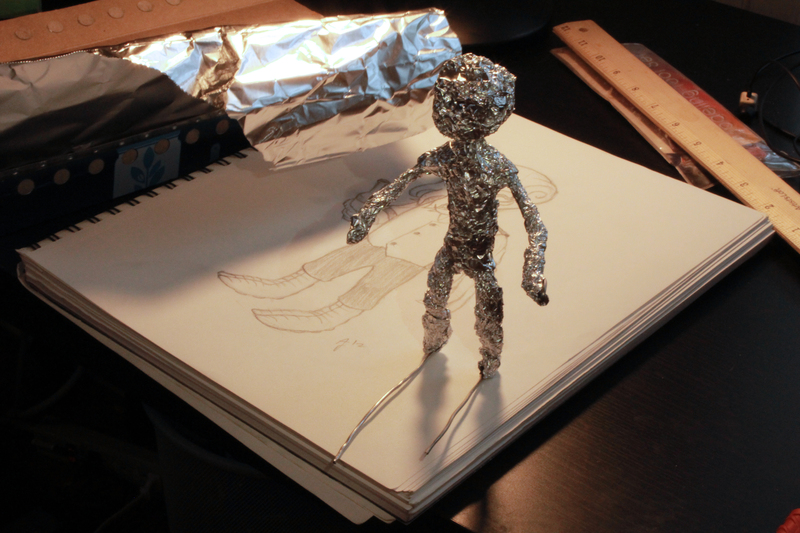 One, foil is a terrible conductor of heat, so it’s presence isn’t going to throw off any time calculations when it comes time to cook the sculpture. Two, it cuts down on the weight of the sculpture, which gives the added benefit that when the clay contracts when drying, it has the foil to give way, rather than solid clay or wire. And, three, it’s cheaper than clay, so the more foil you can stuff in there, the more clay and cash you’ll have left over. I left a few inches of wire coming out of the foot area, and that’s because I inserted them through drilled holes in a scrap piece of PVC board, letting me tie Bud down, making him much easier and safer to handle. Now it’s time for clay! I use Super Sculpey for my maquettes, because it doesn’t dry out until baked, meaning I can take my time, even if I need to come back to the sculpture over the course of a week. For bud, most of the smaller details and thinner pieces will be in his head and upper body, so I created his lower half first. 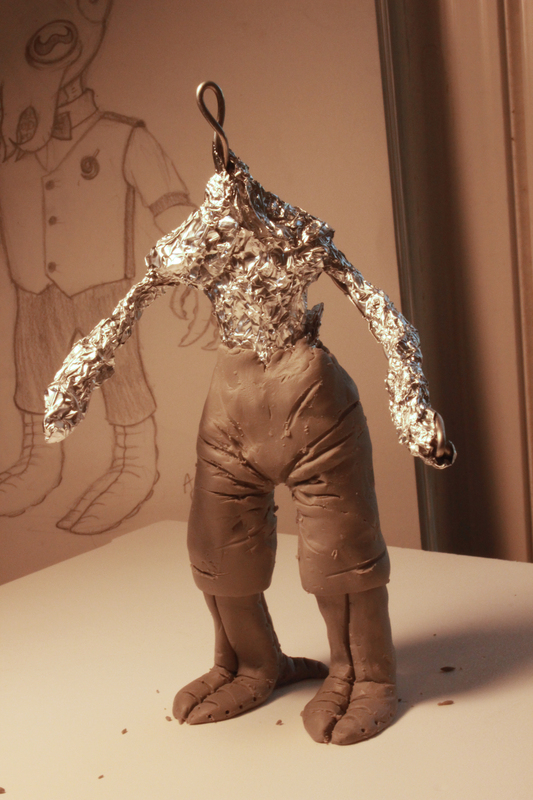 This also, obviously, will give the character more support as I additional weight through clay is added up top. … just pop ’em in the oven (why is it that “pop” is the word everyone uses when putting something in the oven?)! 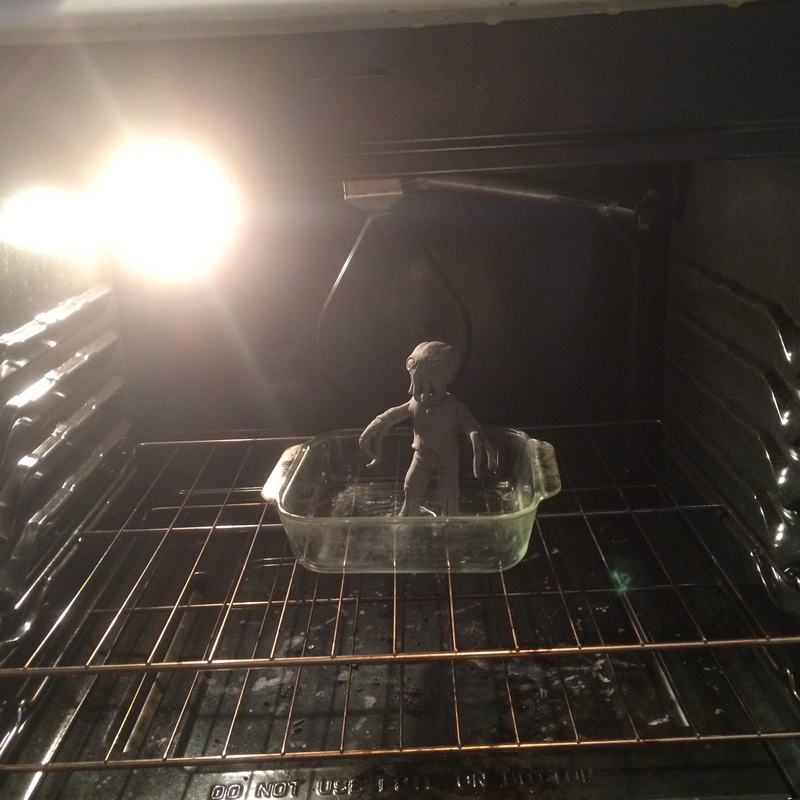 Sculpey requires low heat, under 200 degrees, so you don’t need a kiln. It doesn’t put off any harmful chemicals while baking, but I wouldn’t recommend making cookies right after, unless you really like the taste of rubber. Bud was able to stand in the baking dish because I was able to use the wire that had tied him to the PVC board to wind up and give him necessary support. I hadn’t tried this before, but will be doing it this way from now on. Otherwise, an area of your sculpture will flatten out under the weight of the clay before it can fully harden. And here’s Bud, fully cooled and solidified! From here, I’ll be able to know what I need to adjust when creating the final sculpture that silicone puppet will be made from. 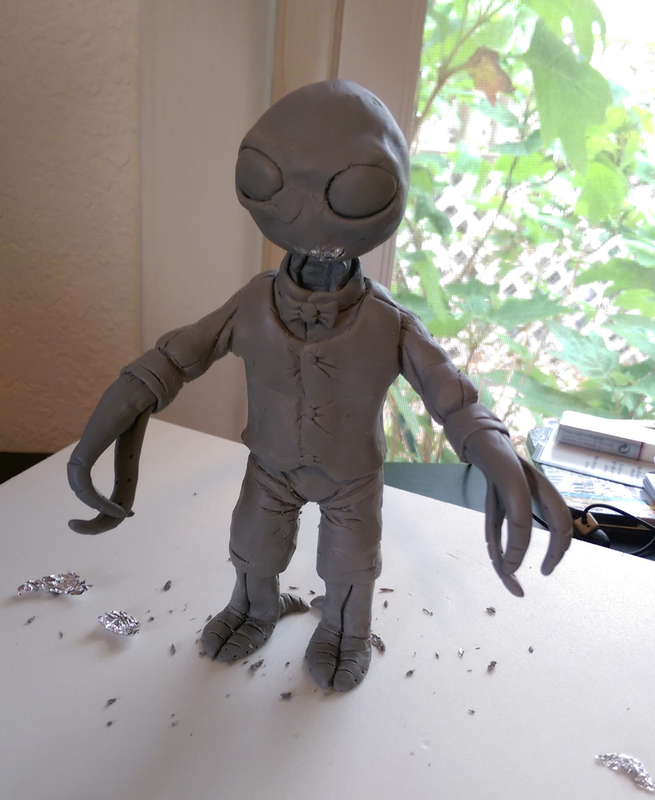 He’s also ready to be painted, and I’ll be able to finalize paint color and style on the maquette, rather than trying to figure it out on the silicone puppet. Speaking of the painted Bud, he’ll be making his debut when “Jupiter IX” launches as a Kickstarter project on Tuesday, April 21st. We’ve been putting a lot of work into developing this project, and we can’t wait to share it with everyone. Keep your eye out for it on Tuesday (I’m shooting for 5pm CT)! 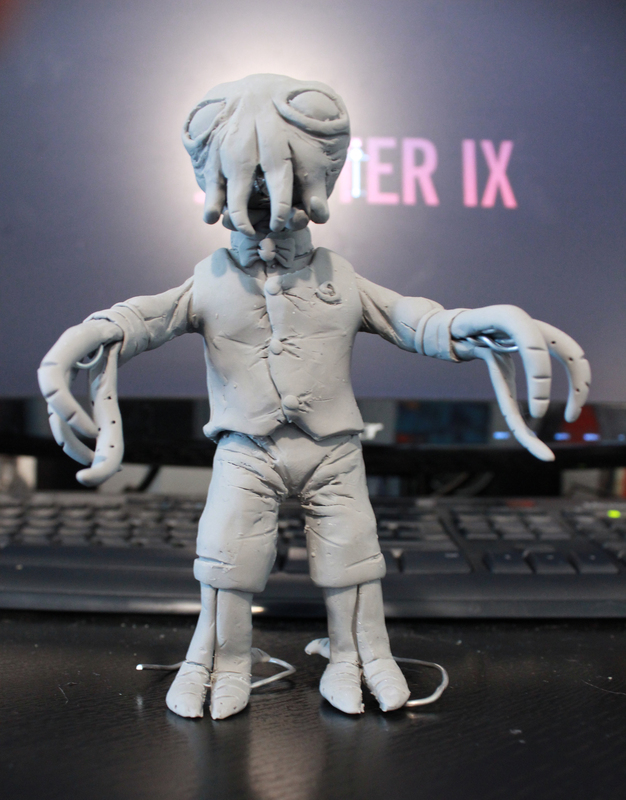 Let me know if you have any questions about my sculpting process or about the Kickstarter campaign! P.S. Luke and I obviously had to shave during the last two years. 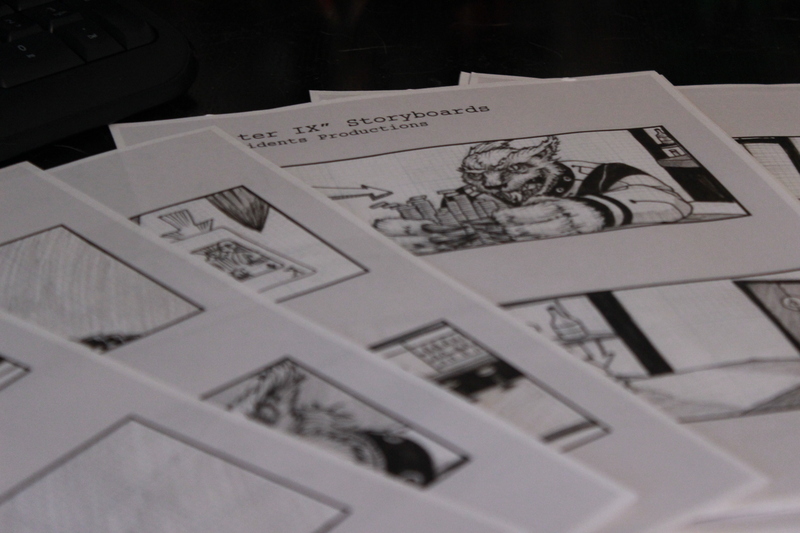 Still in the thick of storyboarding. 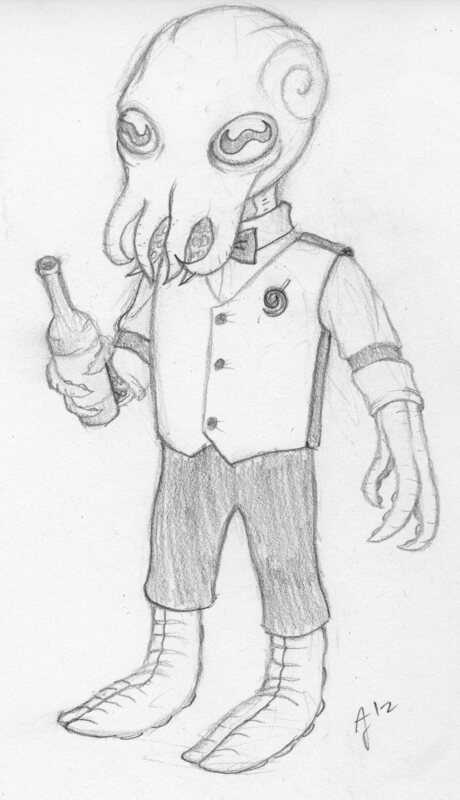 Below is what the drawings look like when I scan them into the computer. I’m doing the boards on a gridded paper, because I wanted the guides when doing the spaceship drawings. However, the decision didn’t really work in my favor, because I thought I could easily remove the blue grid lines, but I can’t without editing the contrast of the pencil and ink work. After this project, I won’t be doing it this way again, since it adds extra work while reducing quality. That’s my favorite page so far.